Wedding season is upon us, and with it are a series of dress and etiquette issues for both host and guests. I’d like to talk first about interpreting the different dress options mentioned on an invitation for men, and next time for women, and then some of the etiquette issues. Saturday night or Sunday night weddings are often black tie, which means male guests are requested to wear a tuxedo. The difference between black tie, black tie invited and black tie requested is only the urgency of the request. With black tie you are strongly encouraged to wear a tuxedo, with with the second two options, only if you want to. The wedding party and close male relatives will wear a tux in any of these situations. The other choice is a classic suit in black, dark gray or navy. Stick with a white shirt. I encourage my clients to buy a tuxedo if they attend more than one formal event a year; your own tuxedo will fit better, be of higher quality, and feel more comfortable. Plus you won’t have to return it! Tuxedos now often have a notch lapel and two buttons, or if you want to be edgier a peak lapel and one button. Shawl collar is very retro, but if you own one by all means wear it. Tuxedo shirts often have a slightly spread pointed collar, and no extra details (like ruffles). You can wear a bowtie or straight tie in black or other solid color. 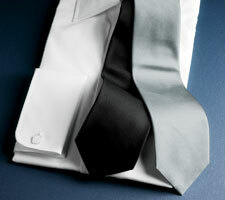 Formal ties have a shiny silk finish so think twice about wearing an ordinary tie as it will not look consistent. Choose a vest or cummerbund, but not both. Personally I love a vest in the tuxedo fabric, but you can wear a black silk vest, or one in a contrasting color or fabric. 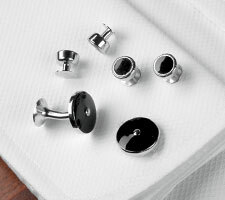 Studs and cufflinks are the final details, although studs are optional if you’re wearing a tie, since they’re hidden. Shoes can be patent leather tuxedo shoes, or very shiny black dress shoes.